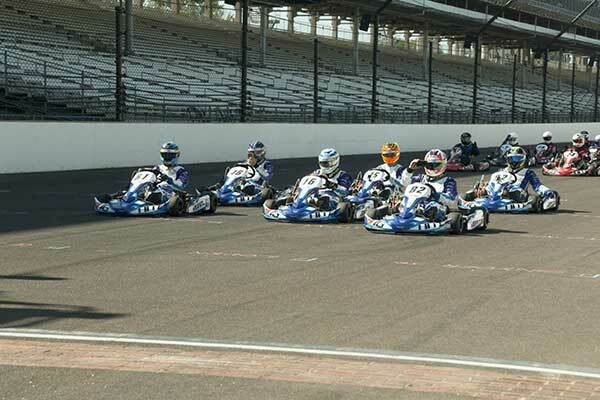 There were seven very happy Kiwi Briggs LO206 category karters amongst the 350 drivers celebrating at Indianapolis Motor Speedway on Sunday evening after a very successful second USAC-sanctioned Battle at the Brickyard kart race meeting over the July 07-08 weekend. Melhop ended up the top finisher of the seven-strong group of Kiwi Briggs LO206 class runners from Wellington who made the trip, finishing 10th in the one-make Margay K3 chassis/Briggs LO206 Ignite Masters class Final (out of 33 starters) and 11th in the main Ignite class Final (out of 44 starters). In the main Ignite class Final Shaun Croskery, Glen Dodd and Kyle Nelson finished line-astern in 25th, 26th and 27th places respectively with Shane Sayer 31st, Mike Hanks 34th and Hadleigh Coffey making it up to 35th after starting from the back row of the grid thanks to missing the Pre-Final because of his crash in qualifying. The course the Battle at the Brickyard meeting ran this year was based on the ‘road course’ at the venue originally created to run the United States Formula 1 GP and the World Championship round of the MotoGP motorcycle series, and included part of the start/finish straight of the Indianapolis 500 course. 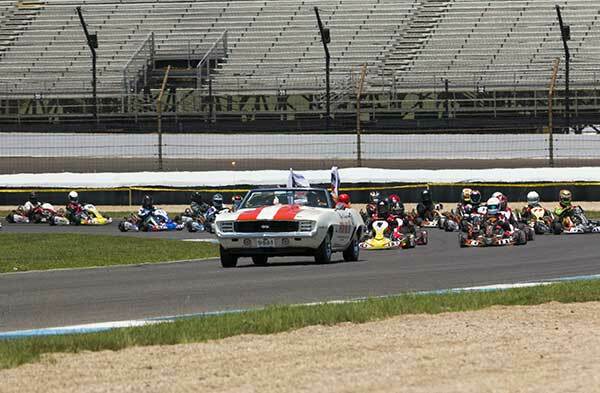 As a special ‘treat’ on Friday evening the 350 karters across the 17 classes entered got to do a parade lap around the full 4.0km (2.5 mile) length of the famous oval. While in Indianapolis the Kiwi karters also took the opportunity to do ‘shop tours’ of both the Andretti Motorsports and Chip Ganassi team race shops… where fellow Kiwi Scott Dixon turned up to say gidday and sign hats, books, posters and a Kiwi flag for the KartSport Wellington club house! 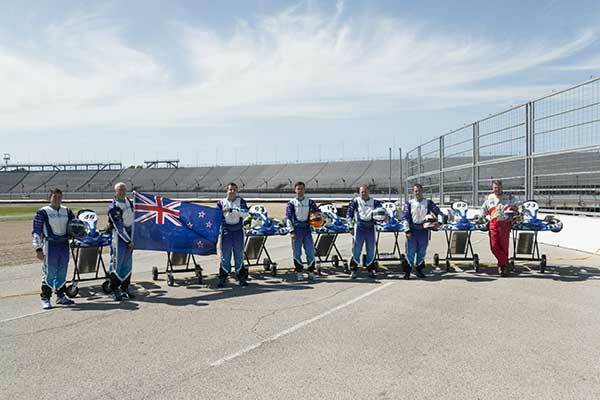 The seven Kiwis ran under the Wilford Motorsport banner with assistance from Auckland-based Carter’s Tyre Service, and Wellington businesses ERS Karting, George Refrigeration and Air Conditioning, Business Knowledge and Typeface. 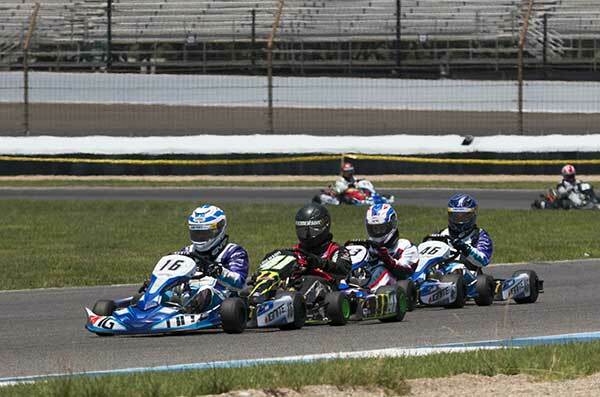 All seven ran the same livery on their Margay Ignite/Briggs LO2016 karts and the same Carter’s Tyre Service helmet visor banner they do at home. Once the novelty of being at the famous ‘Brickyard’ wore off Melhop says that reality of the situation soon became apparent. The style of racing was also new to most of the Kiwis, who had only ever raced their own Briggs LO206 karts at home on purpose-built kart tracks, rather than converted motor racing circuits. With plenty of experience road racing at home Melhop adapted quickest, qualifying fourth (out of 31) in the Ignite Masters class. Shane Sayer was next best with the 10th quickest time then came Glen Dodd (18th) and Mike Hanks (23rd). It was Sayer who set the best time in the open Ignite category though (in doing so achieving one of his stated goals (to beat Brent Melhop! ), setting the 8th quickest time out of a field of 45. Melhop was next with the 10th quickest time followed by Hadleigh Coffey (14th), Shaun Croskery (16th), Glen Dodd (24th), Kyle Nelson (28th) and Mike Hanks (42nd). 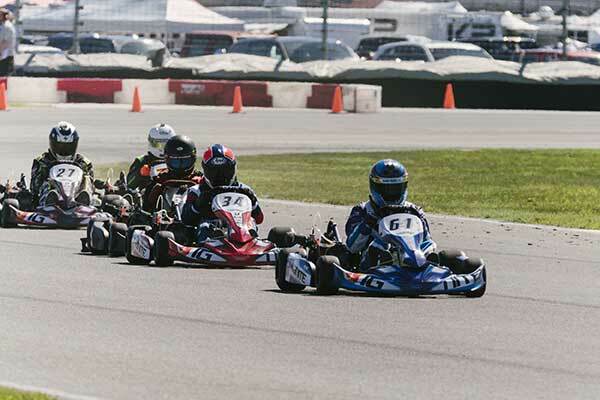 Croskery and Coffey also entered the open-chassis Briggs Medium class but it was in that qualifying session that Hadleigh Coffey crashed heavily, breaking his kart’s seat, bruising his ribs and getting a trip to the track’s state-of-the-art medical centre for a check-up. 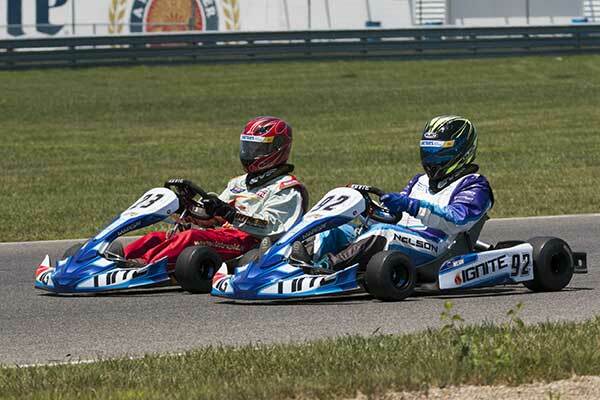 Croskery qualified 26th (out of 54 starters), Coffey 39th despite the early end to his session. Sunday was the big day with the general razzmatazz cranked up to fever pitch. Completing the picture the first class out got to do a lap of the Battle at the Brickyard track behind a 1969 Indy 500 Chevrolet Camaro convertible pace car. Not surprisingly, thoughts amongst the Kiwi group have already turned to a return trip in 2019.